Osteoporosis is a disease involving bone tissue, characterized by low consistency of bone mass per unit volume thereby altering the microarchitecture, rendering them weak and fragile which increases the risk for fractures. Osteoporosis is very commonly seen in people with low peak bone mass, less bone deposition, and greater bone resorption during remodeling. The reason being abnormal bone resorption by the osteoclasts and bone deposition by the osteoblasts. Osteoporotic fragility fractures take place with minimal injury where otherwise a normal bone will not break. The most common sites of such fractures are vertebral column, hip, and wrist. Osteoporosis is one of the few diseases that share equal concerns in both medical and dental communities. Orthopantomogram (OPG) X-ray showing a panoramic view has been used to predict low bone mineral density (BMD) in patients. For identification of osteopenia, methods such as mandibular cortical width, mandibular cortical index, and panoramic mandibular index have been used as tools to indicate signs of resorption on panoramic radiographs. Low BMD can be identified by the thinning of the cortex in lower border of the mandible at the level of mental foramen (CMF). Dual-energy X-ray absorptiometry (DXA) scan is the gold standard for diagnosis of osteoporosis. It uses the T-scoring system. T-score is the comparison of BMD of a participant to that of young adult reference population. According to the World Health Organization, T-score of −2.5 or below is defined as osteoporotic, T-score of −1.0 or greater is normal, and T-score between −1.0 and −2.5 is osteopenia. Decrease in thickness of cortex correlates well with reduced skeletal BMD and behaves as a window to the whole skeleton., Many studies have been conducted to correlate changes clinically, radiologically, and sonologically. Information gathered clinically is regarded as important as panoramic radiographs. Postmenopausal rat models prepared after ovariectomy had been used previously. Some researchers are in favor of positive correlation between osteoporosis and jawbone while others are against it.,,,, General changes in the BMD of mandible on panoramic view and of calcaneus, have been found to be characteristic of the postmenopausal period. Factors affecting both the trabecular and cortical bones were also studied., In a study conducted to see the correlation between mandible and femur using quantitative computed tomography, best correlation was seen in cortical bone area of both. In these ovariectomized rat models, loss of both trabecular as well as cortical tissue was seen, when compared with systemic bones. Radiomorphometric analysis of mandibular bone structure after ovariectomy in mature cynomolgus monkeys, showed significant difference in BMD of mandibular body, some parameters of skeletal continuity and cortical bone width. It was suggested that the morphological changes in the cortical bone are most useful parameters for diagnosis of osteoporosis in the mandibular body region. The present study was designed to observe the radiological changes that take place in younger and older participants after dividing them into normal, osteopenic, and osteoporotic groups. Each variable was then studied in comparison with the subgroups of the same group and with the subgroups of the other group. It was a cross-sectional study. The study tools used were the questionnaire, DXA scan, and OPG X-ray. This study was conducted in the Institute of Basic Medical Sciences, Dow University of Health Sciences, Karachi, Pakistan. Participants of the study were patients visiting Dow Radiology, their attendants, volunteers, patients from Dental and Orthopedic Outpatient Department, Ojha campus, and patients from Dental Outpatient Department, Patel Hospital. This study stretched over 8 months and was completed in 2012. Only females between 25 and 85 years were included in the study. Females with endocrine disorders, menorrhagia, oligomenorrhea, and polymenorrhea were not included in this study. Pregnant and lactating females, people addicted to beetle nut and pan chewing, females on oral contraceptive pills, and hormone replacement therapy were excluded from this study. A total number of participants considered were 174. The sample size was calculated by OpenEpi (version3.01) sample size calculator using the prevalence of the disease. Consecutive sampling technique was used. This was a study on human subjects so an application for the ethical consideration was forwarded to the Ethical Committee of Dow University of Health Science and was approved. No personal information was shared by any individual without taking permission from the study participants and full confidentiality was ensured in general. Informative posters were pasted at different campuses in DUHS inviting females to participate. Having signed a consent form and information sheet, pro forma regarding participant's history was filled. On the basis of history, they were divided into premenopausal (Group I) and postmenopausal (Group II) groups. Group I included 85 females while Group II included 89 females. DXA scan was then performed at Dow Radiology on the basis of which the females were subdivided into normal (pre A, post A), osteopenic (pre B, post B), and osteoporotic (pre C, post C) groups. Group pre A and pre B include 37 females each while pre C included 11 females. Group post A included 25, post B included 38, and post C included 26 females. OPG X-ray was conducted at Patel Hospital. All parameters were worked out bilaterally on OPG X-rays at zoom factor ×0.84 using a software called K-PACS Lite. The mean of the two measurements was put to statistical analysis. Intraobserver and interobserver analysis gave a difference of 0.5 mm each time. The parameters that were considered on OPG were mandibular ramus height (RH) and ramus width (RW), incisure height (IH), angle of mandible (AM), and height of body of mandible at symphysis menti (HS). Cortical thickness was also observed (CMF). RH was worked out by drawing a line along the posterior border of ramus starting at the AM including the condylar process. A perpendicular was drawn from this line to locate the summit of the condylar process. Another line was drawn along the inferior border of the mandible to locate the lower limit of the ramus. The extremes of the line along the posterior border were measured. This was the RH as shown in [Figure 3]. RW was worked out by drawing a perpendicular from the line along the posterior border of ramus to the inner border touching the lower limit of incisures and was modified accordingly. RW was then measured from here as shown in [Figure 3]. Kruskul–Wallis test was applied in the groups where normality assumption was not fulfilled. One-way analysis of variance was applied to evaluate the significance between subgroups of Group I (premenopausal) and Group II (postmenopausal). For multiple comparisons in the subgroups of both groups, Tukey's -B test was applied. Independent samples t-test was applied for intergroup comparison. Mandibular RH is shown in [Figure 1] and mandibular RW in [Figure 2]. 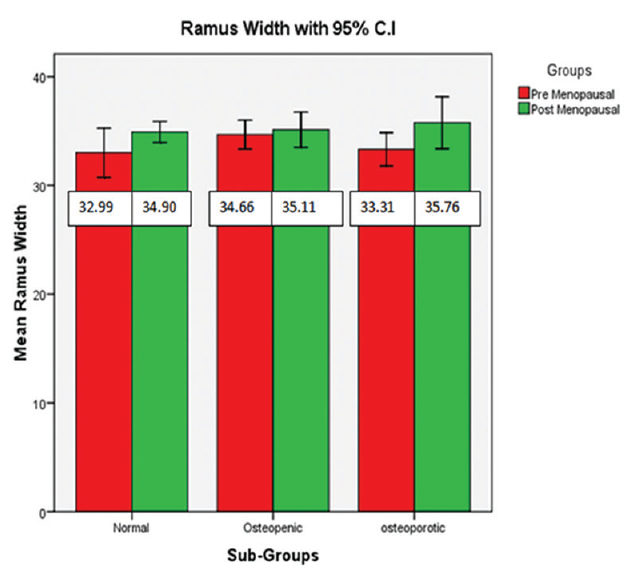 RH and RW for both intragroup comparisons as shown in [Table 1] and [Table 2] and intergroup comparisons as shown in [Table 3] came out to be statistically insignificant in all study groups. All the other parameters showed significant changes. Highly significant increase in the IH and decrease in the AM (A) were seen. The reduction in HS in different study groups was seen. This highly significant decrease in the height of body of mandible was again a positive correlation. The thickness of the mandibular CMF was also found to be decreased significantly. Mandibular bone morphology and architecture are studied in osteoporotic animals and humans in a number of research projects. This study also aims at observing the changes that take place in mandible because of osteoporosis but it is unique, since no other study is still conducted on the changes of mandible where comparison is done in younger and older females excluding the age changes that occur along with decreasing bone mass. Nowadays, complications related to osteoporosis are a concern of every orthopedician. This study aims at helping the orthopedic community in diagnosing osteoporosis early as the study shows changes not only in osteoporosis but also at stage of osteopenia as well. Previously, dentists thought that OPG X-ray is only a domain for them. This being a fact that OPG X-ray not only shows the tooth set but also gives complete details of two more bones, that is, mandible and maxilla; our study tends to behave as a milestone in changing the mindset. OPG X-ray is far more economical than DXA scan. A cost-effective technique can be employed in developing countries, thereby referring patients further for bone densitometry. The studies done previously employed complex methods such as radiological indices in studying mandibular changes. The current study aims at looking closely at the mandibular changes in a simple manner in terms of changes in morphology easily accessed on a radiograph. Studies have shown changes in mandible in participants with and without teeth. Osteoporosis is known to be associated with increased teeth fall. Owing to this fact, the parameter of mandibular RH used by Merrot et al. in 2005, was studied in our study in context with changing bone mass instead of dental status. The changes that occurred were so negligible that they turned out to be insignificant in all the study groups. Same results regarding the RH were seen by Merrot et al. in 2005 as were found in our study. Changes in mandibular RW were found to be insignificant in all the groups studied. This finding is in agreement with the study of Bozic and Ihan Hren, 2005, in which RW was found to be more constant when compared with height of body of mandible. The goal of this study was to establish changes in mandible so that a simple screening tool could be developed to advise females for further bone assessment. The findings recommend that OPG X-rays could comfortably be used by orthopedic community to add this cost-effective radiographic technique to their investigation list supporting financially compromised participants of our community. However, clinical implementation of this facility is still a question; further studies in this regard could help find a solution. There is much to be done that could not be carried out because of certain limitations. One could look forward to clear out facts regarding maxilla, alveolar ridges, trabecular separation, cortical shape, and relative bone density regarding age and osteoporosis. Early detection of osteoporosis for both premenopausal and postmenopausal groups cannot be done using the mandibular RH and mandibular RW as these variables show insignificant changes in all the study groups. Thereby, these two parameters on an OPG X-ray can neither be used as a screening tool nor as early detector of osteoporosis. Other findings for rest of the parameters concluded that the OPG X-ray can be used as a screening tool for osteoporosis. In addition to this, the study also concludes that looking at the IH and thickness of mandibular CMF, early detection of osteoporosis can be done, as these variables show changes at the stage of osteopenia. The IH and thickness of mandibular CMF were seen as parts of mandible that show osteoporotic changes exceeding age changes. As decrease in angle (A) of mandible was observed at stage of osteopenia, it can be conveniently used for early detection of osteoporosis. Authors thank Members and Chairman, IRB, BASR, and Research Funding Committee, DUHS, for providing an opportunity and funding the research project. We thank Director, Institute of Basic Medical Sciences, DUHS, for his continuous guidance and special gratitude to Head of Anatomy Department, Sindh Medical College, DUHS, Associate Professor, Anatomy, DIMC and Associate Professor, Radiology, DUHS, for their nontiring support to finish the research work. We thank Director Research, DUHS and Director, DDRRL, DUHS, for their cooperation. We thank Department of Biostatistics for statistically handling the data. We are grateful to the technical staff for technically managing the patients at Radiology Departments, Dow and Patel Hospital and special thank to all the volunteers who participated in the study and helped to collect the data. This study was financially supported by Dow University of Health Sciences and Patel Hospital. Dorland's illustrated medical dictionary. 31th ed. Philadelphia: Saunders Elsevier; Osteoporosis 2007. p.1348. Raisz LG. Pathogenesis of osteoporosis: Concepts, conflicts, and prospects. J Clin Invest 2005;115:3318-25. Chami G, Jeys L, Freudmann M, Connor L, Siddiqi M. Are osteoporotic fractures being adequately investigated? A questionnaire of GP and orthopaedic surgeons. BMC Fam Pract 2006;7:7. Sabzwari SR, Azhar G. Ageing in Pakistan: A new challenge. Ageing Int 2011;36:423-7. Fatima M, Nawaz H, Kassi M, Rehman R, Kasi PM, Kassi M, et al. Determining the risk factors and prevalence of osteoporosis using quantitative ultrasonography in Pakistani adult women. Singapore Med J 2009;50:20-8. Sioka C, Fotopoulos A, Georgiou A, Xourgia X, Papadopoulos A, Kalef-Ezra JA. Age at menarche, age at menopause and duration of fertility as risk factors for osteoporosis. Inf Healthc 2010;13:63-71. Rizzoli R, Bruyere O, Cannata-Andia JB, Devogelaer J, Lyritis G, Ringe JD, et al. Management of osteoporosis in the elderly. Curr Med Res Opin 2009;25:2373-87. Karasik D. Osteoporosis: An evolutionary perspective. Hum Genet 2008;124:349-56. 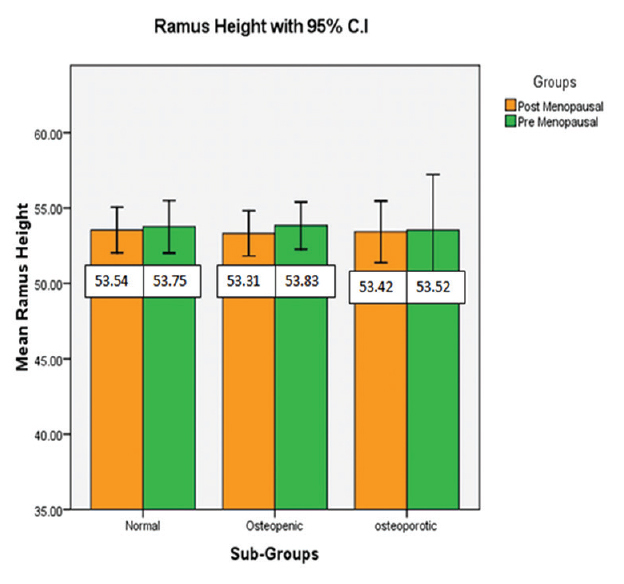 Rehman DS, Rafique M, Hussain M. Cortical changes in orthopantomogram of Human Mandible as early detector of osteoporosis. Med Forum 2013;24:9. Yüzügüllü B, Gulsahi A, Imirzalioglu P. Radiomorphometric indices and their relation to alveolar bone loss in completely edentulous Turkish patients: A retrospective study. J Prosthet Dent 2009;101:160-5. White SC, Taguchi A, Kao D, Wu S, Service SK, Yoon D, et al. Clinical and panoramic predictors of femur bone mineral density. Osteoporos Int 2005;16:339-46. Rehman DE, Qureshi S, Abdul Haq A. Early detection of osteoporosis from incisure depth of human mandible in an orthopantomogram. J Pak Med Assoc 2014;64:766-9. Rehman DE, Sarwath S, Nigar S. Association between changes in the angle of mandible and reduced bone mineral density. J Coll Physicians Surg Pak 2015;25:87-90. Tanaka M, Toyooka E, Kohno S, Ozawa H, Ejiri S. Long-term changes in trabecular structure of aged rat alveolar bone after ovariectomy. Oral Surg Oral Med Oral Pathol Oral Radiol Endod 2003;95:495-502. Irie K, Sakakura Y, Tsuruga E, Hosokawa Y, Yajima T. Three-dimensional changes of the mandible and alveolar bone in the ovariectomized rat examined by micro-focus computed tomography. J Jpn Soc Periodontol 2004;46:288-93. Jagelaviciene E, Kubilius R, Krasauskiene A. The relationship between panoramic radiomorphometric indices of the mandible and calcaneus bone mineral density. Medicina (Kaunas) 2010;46:95-103. Boonen S, Cheng XG, Nijs J, Nicholson PH, Verbeke G, Lesaffre E, et al. Factors associated with cortical and trabecular bone loss as quantified by peripheral computed tomography (pQCT) at the ultradistal radius in aging women. Calcif Tissue Int 1997;60:164-70. Ferretti JL, Gaffuri O, Capozza R, Cointry G, Bozzini C, Olivera M, et al. Dexamethasone effects on mechanical, geometric and densitometric properties of rat femur diaphyses as described by peripheral quantitative computerized tomography and bending tests. Bone 1995;16:119-24. Jiang GZ, Matsumoto H, Hori M, Gunji A, Hakozaki K, Akimoto Y, et al. Correlation among geometric, densitometric, and mechanical properties in mandible and femur of osteoporotic rats. J Bone Miner Metab 2008;26:130-7. Asai H, Kozai Y, Mutsumoto Y, Kawamata R, Kamasaka S, Sakuria T, et al. Radiomorphometric analysis of mandibular bone structure after ovaricetomy in mature cynomolgus monkeys. Oral Sci Int 2005;2:54-63. Laster WS, Ludlow JB, Bailey LJ, Hershey HG. Accuracy of measurements of mandibular anatomy and prediction of asymmetry in panoramic radiographic images. Dentomaxillofac Radiol 2005;34:343-9. Bozic M, Ihan Hren N. Osteoporosis and mandibles. Dentomaxillofac Radiol 2006;35:178-84. Cummings SR, Ensrud K, Delmas PD, LaCroix AZ, Vukicevic S, Reid DM, et al. Lasofoxifene in postmenopausal women with osteoporosis. N Engl J Med 2010;362:686-96. Merrot O, Vacher C, Merrot S, Godlewski G, Frigard B, Goudot P. Changes in the edentate mandible in the elderly. Surg Radiol Anat 2005;27:265-70.